J.M. DeMatteis's CREATION POINT: HAIL STAN AND JACK! 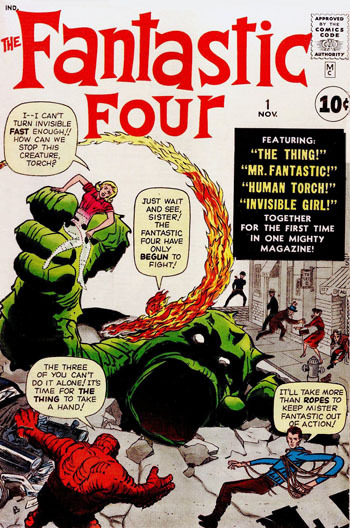 Fantastic Four #1 came out fifty years ago today, kick-starting the Marvel Comics revolution. If it hadn't, if Stan Lee and Jack Kirby hadn't cast their magic spell over the comic book industry, changing the creative rules of the game, there's a very good chance I would have left comics behind in junior high school (for the record, the first F.F. I remember reading was #54, at the tail end of the seventh grade) and never even considered writing them. And I'm sure there are dozens, if not hundreds, of comic book creators who would say something similar. You simply can't underestimate the impact that Lee and Kirby had—and still have. Hail the power of imagination! Hail Stan and Jack! Absolutely perfectly said, J.M. I agree with everything, but would even expand the number to thousands. : ) Hail Stan and Jack indeed! And, if you don't mind, a little self-promo: the 3rd and final volume of "The Sorcerer's Children: A Spell For Tears" is in print now! It's available at Amazon.com. Also available are the first two volumes as well. Please, tell everyone you know! Alison out did herself with the 3rd volume, I must say! Thanks, J.M. Hype away, A. Jaye! And, yes, thousands may be a better number when it comes to Stan and Jack's influence! Thanks, J.M. We're quite happy with how the final volume came out. 124 pages--it's massive for us. Alison did almost everything--pencils, inks, toning, lettering, writing, scanning, etc ... Quite the undertaking that took a number of years to complete. Phew! Please, let everyone you know know of it. Word of mouth is very powerful, my friend, as you know. Thanks, again! You are the best. Saw the Twitter RT. Thx! I thought the several months off thing for issues came later. I also thought that it was November because Marvel double timed some issues to synch up #600 with the anniversary in November. It doesn't matter though, this book changed everything, it came out long before I was born and I still was blown away upon first reading it. Everyone knows that the ol' F.F. were Marvel's first family, but they were also comics first dysfunctional one. Sure some of those early issues had hokey plots, but those great characters hit you like a ton of bricks. Plots were secondary (though many were great) Stan and Jack knew that in a serialized medium characters were and are everything, and this simple revelation stopped the age problem that had haunted comics since the '30's and within a few years Marvel was receiving letters from well spoken teenagers, then university students. And not only did this lead to a host of some of the most amazing new Characters in comics (now called the Marvel Universe), but by capturing the imaginations and giving early writing jobs to the likes of Len Wein, Denny O'neil and Steve Englehart brought classic DC characters to a new level of quality. This May be the single most important issue in the history of comics. And no matter what any one tells you, it was group effort, neither Stan or Jack is fully responsible, it really is a shame that fact seems to lost between two warring camps claiming it was a single persons doing. And if you really want to know about the quality go here http://www.youtube.com/watch?v=yPraYZ_SjtE were copmpatent voice actors made it shine all the way back in the 60's. But really I have no thoughts on everyone's favorite foursome, after all, as you can see I don't really think about them very much, or the impact. We're pretty much in agreement, Jack...especially when it comes to the idea that the FF series was a blending of Stan and Jack's sensibilities. Even as the book evolved, and Kirby began plotting on his own, Stan's impact, as editor, dialogue writer and art director, made the book as much his as Jack's. What an amazing run of comics -- especially in the mid-sixties when it seemed that, each and every month, they unleashed a brand new concept or character, each one guaranteed to blow our young minds. This really was the comic book that changed everything for mainstream superhero sagas. A good demonstration of how important character was then, is a comic called "Fantastic Four: Unstable Molecules." It's about the "real" story of the F.F. 's origins. No powers, nop arch nemeses, but every bit Loyal to Stan and Jack's creations. Also I forgot to mention something, that one of the best thing's about the old F.F. is that they are all such great well rounded characters, you could meet and believe in, but the are none of them a whole person without the other three. We'd all owe Stan and Jack a great debt for "unstable molecules" alone. Happy 50th to the World's Greatest Comic Magazine! I think it's time for America to star in a movie for Prince Namor as a way of getting out of our financial difficulties! As someone once pointed out, Jack, those four characters are so well defined -- their attitudes and speech patterns so specific -- that you can have a panel with four word balloons pointing to the Fantasti-Car and, sight unseen, you'd know who's talking in each of those balloons. Y'know, David, I've been shopping for clothes made of unstable molecules for years, but I can never find them. You'd think Reed would have opened up his version of the Gap by now. Wow, Jeff, that one took me a minute -- but it was worth the effort: very funny. Reed clearly saw the dangers of mixing unstable molecules and unstable relatives on Thanksgiving, the day when everyone's looking for some stretchy pants. The internet revolution has been won! Technology transformed bloggers into journalists, and now we can be late night comedians, too.